the capital of Ukraine and my native city! The unveiling of the Golden Gate (Ukr. – Zoloti Vorota) took place in Kyiv in May 1982, the year when 1500 anniversary of the city was celebrated. Public excitement was widely observed in Kyiv that day. Everybody wanted to see the new reconstructed main entrance to the old “City of Yaroslav”, great duke who had built it in the mid-eleventh century. Present-day Gate is not the exact copy of old Rus one as no descriptions of how the gate had looked like exist in our days. Nevertheless, the Golden Gate is a very important historical monument and a remarkable landmark in the history of Kyiv Rus and present Ukraine. 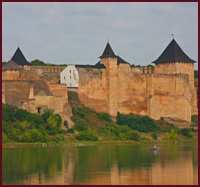 At the times of Kyiv Rus together there were three gates. The Golden Gate was considered to be the main one. 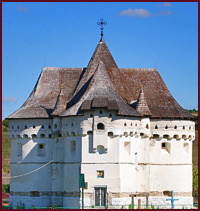 It was built in 1164 and used till the mid-eighteenth century, mostly for ceremonial events. This was happening regardless the fact that, according to the painting of van Vesterfeld made in 1651, it was already ruined. Ceremonial processions praising Bohdan Khmelnyts’kyy win at Zhovti Vody as well as other important historical events were held here. The construction and the purpose of the Golden Gate were quite unique for its time. It carried out two main functions – first, as the gate and tower of the fortress, the defensive role, second, ceremonial role. The Golden Gate was, kind of, triumphal arch and had some similarities with the main gate of Constantinople, the capital of Byzantium, as in the times of Christian Kyiv Rus architects were mostly orientating themselves towards Byzantium architectural style. ЗThe main gate to Constantinople led to the main square Augusteion where the palace and St. Sophia’s Cathedral was situated. 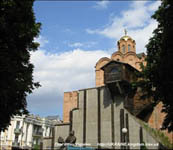 Same situation was with the Golden gate which served as the entrance to the architectural assembly of St. Sophia’s Cathedral and the monasteries. At those times the gate was 12 meters high and 6,9 meters wide. 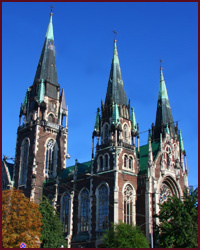 Church of the Annunciation with its golden cupola was situated on the top of it. The gate was hardly ruined in 1240 when Tatar-Mongol hordes plundered Kyiv. Later as the time passed, the Golden Gate fell into the decay even more. In XVIII century everything that was left from the authentic old gate was buried and the new gate was build according to the project of Deboskret. In 1835 archeological studies were carried out by Lohvits’kyy. He found the remains of the old gate – two walls 25 and 13 meters long and 8 meters high. Architect Beretti conducted conservation and reconstruction works to preserve the old monument which was surrounded by the railing at that time. 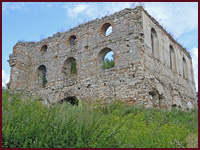 Till 1982 the remains stayed in such a condition and slowly was ruining even more by the time. 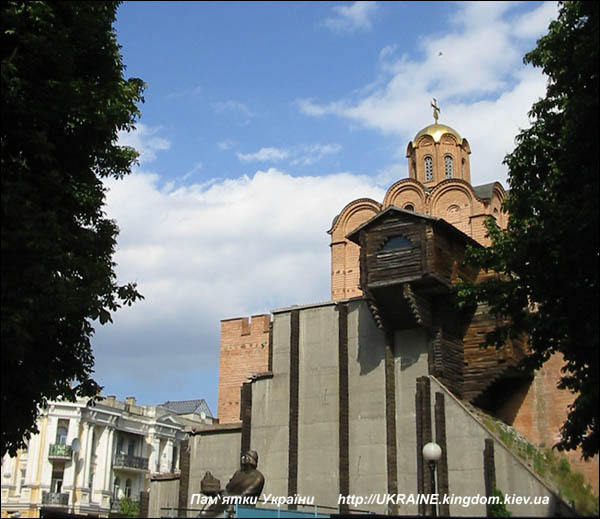 In 1970 new pavilion was started to have been built in order to preserve the remains and have the approximate look of the main entrance to the ancient Kyiv. 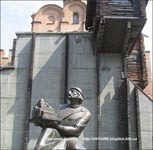 The new construction consisted of the tower 14m high, and, in the outer front, of a small protuberance – “small tower” and a passage which, from one side, looked like a wooden vertical-lift railing forged with metal and, from the other, like the leaves similar to the ones of the preserved gates in Suzdal and Novhorod. 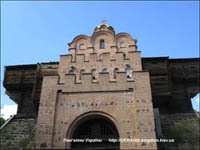 During the reconstruction of the on-gate church ancient Rus ornaments were used. The monument to Yaroslav Mudryy (Yaroslav The Wise) was erected next to the Golden Gate.